Olav Krigolson at the HI-SEAS habitat, an old cinder quarry on Hawai‘i’s Big Island that helps NASA scientists prepare for a mission to Mars. Photo: Gordon Binsted, UBC Okanagan. Hidden away from the lush landscape of Hawai‘i’s Big Island featured in vacation photos and nestled at more than 2,400 metres’ elevation on the northern slope of Mauna Loa lies a dusty red landscape. Here sits a white geodesic dome, intended to replicate the structure a space crew would call home during a long mission on Mars. The HI-SEAS (Hawai‘i Space Exploration Analog and Simulation) habitat is in an abandoned cinder rock quarry. The area is surrounded by recent lava flows, with little plant or animal life present. The desolate landscape is an ideal stand-in for Mars. 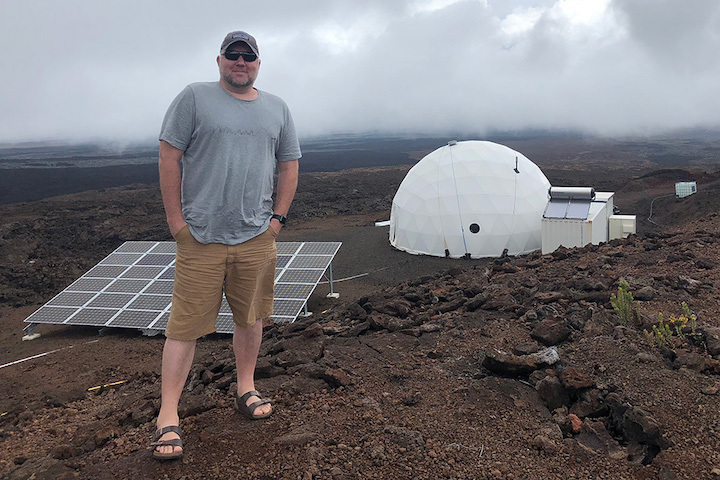 The HI-SEAS project, funded by NASA and led by the University of Hawai‘i at Mānoa, studies human behavior and performance and aims to help determine individual and team requirements for long-term space exploration missions, including travel to Mars. A University of Victoria researcher has a key role in the project. Olav Krigolson will study how the astronauts’ brain function might be affected by the rigours and stress of space travel. “It’s really kind of eerie,” says Olav Krigolson, (BEd ’97, PhD ’07) of the habitat. “It looks like Mars, it’s in the middle of a red volcanic field, and in the distance you can see Hawai‘i—or what Hawai‘i is supposed to look like,” laughs the UVic neuroscientist, researcher and the Associate Director of the Centre for Biomedical Research. A Mars mission would take an estimated three years to complete. Krigolson will use portable electroencephalography (EEG) systems in the form of MUSE headbands and PEER research software to monitor the brain activity of crew members. These systems measure voltage fluctuations within the neurons of the brain. Using this technology, Krigolson will be able to monitor the crew’s brain activity right from his UVic lab. His team will look for signs of fatigue, stress and overall brain health. The point is prevention. Eventually NASA hopes to understand when astronauts need intervention. The crew in the HI-SEAS habitat communicate through email and there is a 20-minute delay to simulate space travel—so no phones or Skype. They only leave the small habitat for short periods wearing simulation spacesuits. As well, the six crew members don’t interact with anyone outside the simulated mission. The geodesic dome is 11 metres in diameter, enclosing a volume of 384 cubic metres. The ground floor includes common areas such as kitchen, dining room, bathroom with shower, lab, exercise and common spaces. The second-floor loft has six separate staterooms. One of Krigolson’s teams is currently using the same portable EEG systems, combined with the PEER research app, to test fatigue levels in doctors working at Victoria’s Royal Jubilee Hospital. The hope is that preventing overtired doctors from working will eliminate mistakes. Another of Krigolson’s teams recently returned from Mount Milligan Mine in Northern BC, having conducted similar research on miners. The next HI-SEAS mission is set to begin soon. Krigolson will return to train the crew to use his technology and will monitor them from UVic throughout their mission and, ultimately, present his data and analysis to NASA. He hopes they will continue to use his work throughout their real voyages. “What the future version of the tech looks like is to be determined,” he says, but he is confident their research will help NASA better understand their astronauts’ mental space.